When it comes to keeping your property safe, deadbolt locks are a great option! When it comes to keeping your property safe with deadbolt locks, professional services are the best option. Deadbolt locks are one of the top choices for basic home security. However, without competent, professional installation, your deadbolts may be worse than useless. Improperly installed deadbolts can offer a false sense of security and undermine your home safety plan. But, with Pros On Call deadbolt lock services, you get the top-quality installation done right the first time. We can also help you choose the best type of lock for your security needs, budget and home decor style, along with a wide variety of other deadbolt installation and lock services. 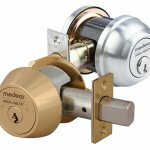 What Are Deadbolt Locks And Why Do We Need Them? Single or double cylinder deadbolt locks are an absolute must for effective residential and commercial security, and our mobile locksmiths are armed with the equipment needed to work with top brand-name locks like Kwikset, Schlage and Defiant. Unlike the spring bolt locks on most doors, a deadbolt is nearly impossible to open without a key or without turning the bolt from the inside. Force on the bolt will not open the lock, making break-ins much harder. 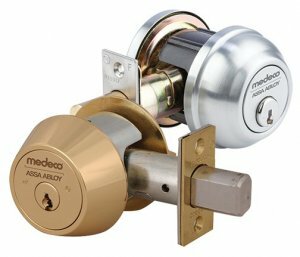 Besides making it more difficult to open the lock by force, a deadbolt’s cylinders also protect the locking mechanism and help prevent lock-picking. Overall, the deadbolt is one of the easiest and most effective tools you can use to make your home or business more secure. Deadbolts are an affordable way to double the security of any door, but where does the name “deadbolt” come from? The first recorded use of the term is from 1902 and referred to the fact that the lock must be opened with a key and has no “live” spring-action. Deadbolts are mostly trouble-free, but they do require regular maintenance. Locks can be cleaned with a damp rag, but avoid using harsh or abrasive chemicals. You should also lubricate deadbolts once a year with graphite, Teflon or other dry lubricants. For more extensive maintenance, Pros On Call is here! Our expert locksmith technicians are on call to meet your deadbolt needs at a moment’s notice. Make arrangements in advance for your home improvement projects, or call us when you’ve got a deadbolt emergency. We are a 24-hour locksmith company, licensed, bonded, insured and ready to deal with any deadbolt and other lock issues. Our friendly, expert technicians all bring five or more years of experience to the job and have the latest tools and equipment at their disposal. When you come to us, you can choose from the top deadbolt brands and have the help of a professional who’ll work with your budget and your style to find the best lock for you. To help you get the best deal possible, we will always provide honest assessments and upfront pricing. Besides routine installation and repair, Pros On Call is also available for emergency locksmithing services with a 30 minute or less response time, all the time. If you’re faced with a broken or stuck deadbolt and need a friendly and highly-trained locksmith right away, then we’re the company to call! Ask us for deadbolt lock assistance today! Deadbolt Locks https://prosoncall.com/locksmith/lock-services/deadbolt/ 3.7/5 based upon 13 reviews.